Nestled behind the Fred Meyer store in Canby you will find a jewel of a park that captures the heritage of the area, as a small industrial park grows around it. Arneson Garden is filled with old-growth trees and has a trail that circles the garden, taking you on a nature walk minutes from a small city. The horticultural park offers areas to have a picnic, walk, take the dog out and benches to just sit and enjoy the birds, squirrels and other woodland creatures that find their way into the small garden. However where this small park shines – it is only 1.8 acres – is the large group of native and hybrid species of azaleas. Named after Ivan and Robertha Arneson, long-time Canby residents who were world-renown in their work on hybrid azaleas, the park is a memorial to them. Ivan died in 2005, yet today his azaleas are still some of the most popular on the market. Over 40 years of azalea hybridization is represented in the small park. Arneson ran his 29-arcre nursery from1959 until 1999. The arnesons pioneered the hybridization of Mollis and Exbury azaleas when they started and continued it during the entire time they owned the property. They purchased stock which originated from England and New Zealand, and then brought in plants from Canada to give them more durability. Their goal was to develop outstanding colors, superior mildew resistant foliage, vigorous growth and floriferous plants. The two spent their lives striving for the perfect plant. The park is sloped and also uses berms that the azaleas are planted on. This was how Arneson makes sure there was plenty of drainage for his crop. 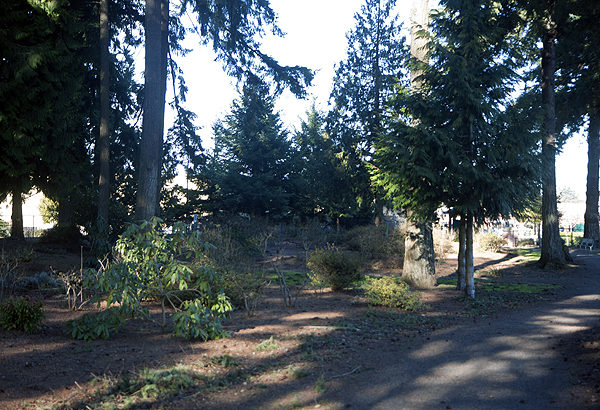 During the winter months the plants are rather dormant and there isn’t a lot to see in the park, aside from the big Douglas Fir trees and the Western Cedar Trees at the east end of the park. There are plenty of benches, so if you are looking for a place to stop and eat lunch, or just get some quiet time, the park is the perfect place for a short stop to stretch your legs. The park was created in May 1999 when the Fred Meyer development was constructed on part of Arneson’s nursery. The development company donated the park to the city as part of the approval process. More than40 years of azalea hybridization is represented in the park, and there is a sign that outlines the different types of azalea varieties you can find in the park. It even has pictures so you can make a game out of figuring out which plant has what name. This is especially fun with young kids, teaching them about gardening and different plants. The park has an open layout, it’s fenced in and is pretty flat so you can take a nice walk and let the kids run and play with no really worries about them escaping or getting lost. Between the lessons on local history, gardening and taking a nice walk, Arneson’s Garden in Canby is a great quick stop when you need to stretch your legs. About Arneson’s Garden: This is a 1.8-acre park in Canby, Oregon that outlines the history of the property as a nursery which cultivated azaleas. A long-time Canby family owned a nursery on the property for more than 40 years and became world famous for their azaleas. What to bring: There is no water or bathrooms at the park, so come prepared. While it is under the canopy of Douglas Fir trees, it is still outside so dress accordingly. Tip: Make sure to stop and read the intereptive signs to learn more about the property and the family who made it a reality. In addition, the best time visit the park is in spring and summer as the azaleas are in full bloom and look amazing. Getting there: The park is located at 249 S. Sequoia Parkway in Canby. It is behind the Fred Meyer development and has plenty of parking.